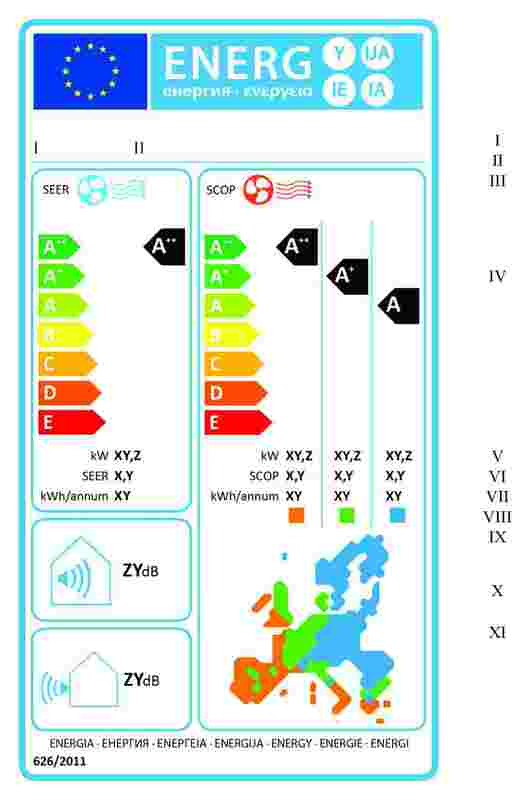 Provisions for the energy labelling of air conditioners were established by Commission Directive 2002/31/EC of 22 March 2002 implementing Council Directive 92/75/EEC with regard to energy labelling of household air-conditioners (2). The implementing Directive establishes different labelling scales for air conditioners using different technologies and the determination of energy efficiency is based on full load operation only. The electricity used by air conditioners accounts for a significant part of total household and commercial electricity demand in the Union. In addition to the energy efficiency improvements already achieved, the scope for further reducing the energy consumption of air conditioners is substantial. Directive 2002/31/EC should be repealed and new provisions should be laid down by this Regulation in order to ensure that the energy label provides dynamic incentives for manufacturers to further improve the energy efficiency of air conditioners and to accelerate the market transformation towards energy-efficient technologies. The provisions of this Regulation should apply to air-to-air air conditioners up to 12 kW cooling power output (or heating power output, if only heating function is provided). Technological developments in the energy efficiency improvement of air conditioners have been very rapid in recent years. This has allowed several third-countries to introduce stringent minimum energy efficiency requirements and led to a process of introducing new energy labelling schemes based on seasonal performance. Today's appliances, excluding single and double duct air conditioners, that achieve the highest efficiency levels have largely surpassed the A efficiency levels established by Directive 2002/31/EC. 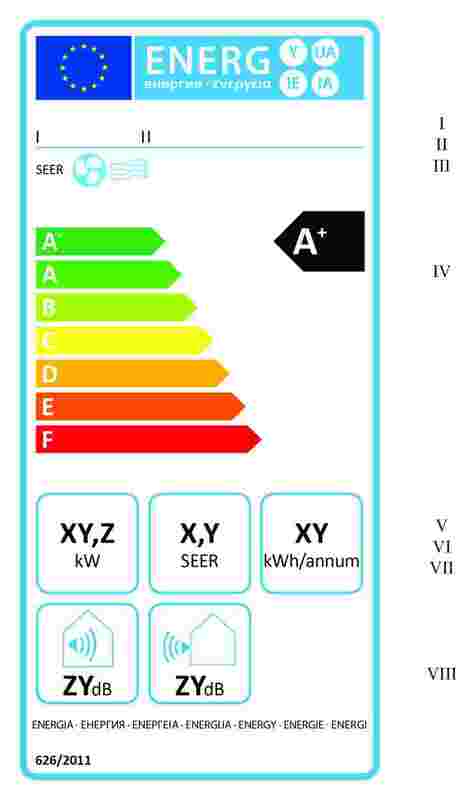 This Regulation introduces two energy efficiency scales based on the primary function and on specific aspects important to consumer. Given that air conditioners are used mainly in part-load conditions, the efficiency testing should be changed to a seasonal efficiency measurement method, except for single and double duct air conditioners. The seasonal measurement method takes better into account the benefits of the inverter driven technology and the conditions in which these appliances are used. 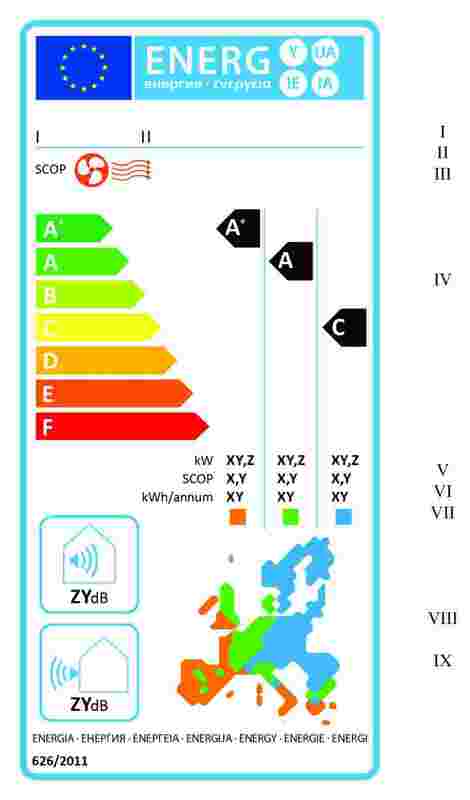 The new efficiency calculation method with an Ecodesign implementing measure setting minimum energy efficiency requirements higher than the current A level, will lead to a reclassification of these appliances. Consequently, split, window and wall air conditioners should have a new A-G energy efficiency class scale with a ‘+’ added on the top of the scale every two years until the A+++ class has been reached. For double duct and single duct air conditioners, steady-state energy efficiency performance indicators should continue to be applied, as there are currently no inverter units on the market. As no reclassification of these appliances is appropriate, single and double duct air conditioners should have an A+++-D scale. While these, inherently less efficient than split appliances, can go only up to an A+ energy efficiency class in a scale of A+++-D, the more efficient split appliances can reach up to the A+++ energy efficiency class. This Regulation should ensure that consumers get more accurate comparative information about the performance of air conditioners. 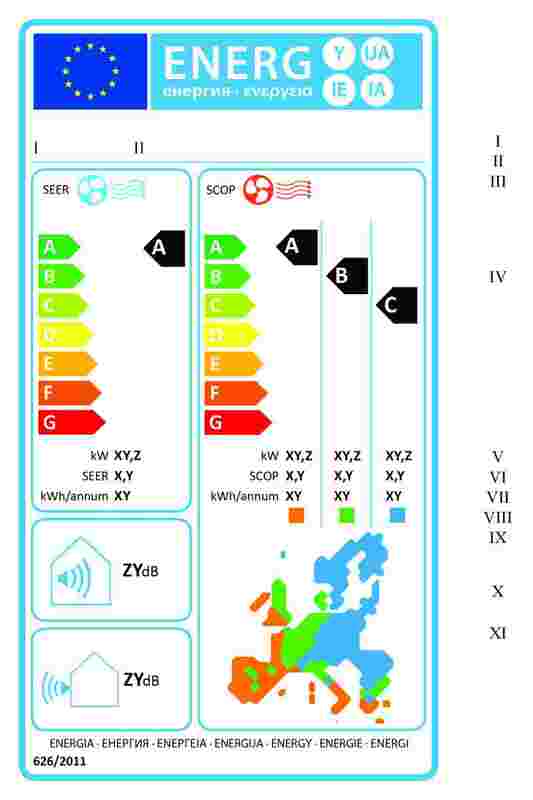 The combined effect of energy labeling set out in this Regulation and of Regulation implementing Directive 2009/125/EC of the European Parliament and of the Council with regard to ecodesign requirements for air conditioners (3) is expected to result in annual electricity savings of 11 TWh by 2020, compared to the situation if no measures are taken. The noise level of an air conditioner could be an important aspect for end-users. In order to enable them to make an informed decision, information on noise emissions should be included on the label of air conditioners. The information provided on the label should be obtained through reliable, accurate and reproducible measurement procedures, which take into account the recognised state of the art measurement methods including, where available, harmonised standards adopted by the European standardisation bodies, as listed in Annex I to Directive 98/34/EC of the European Parliament and of the Council of 22 June 1998 laying down a procedure for the provision of information in the field of technical standards and regulations (4). This Regulation should specify a uniform design and requirements as to the content of labels for air conditioners. In addition, this Regulation should specify requirements as to the technical documentation and the fiche for air conditioners. Moreover, this Regulation should specify requirements as to the information to be provided for any form of distance selling, advertisements and technical promotional material of air conditioners. 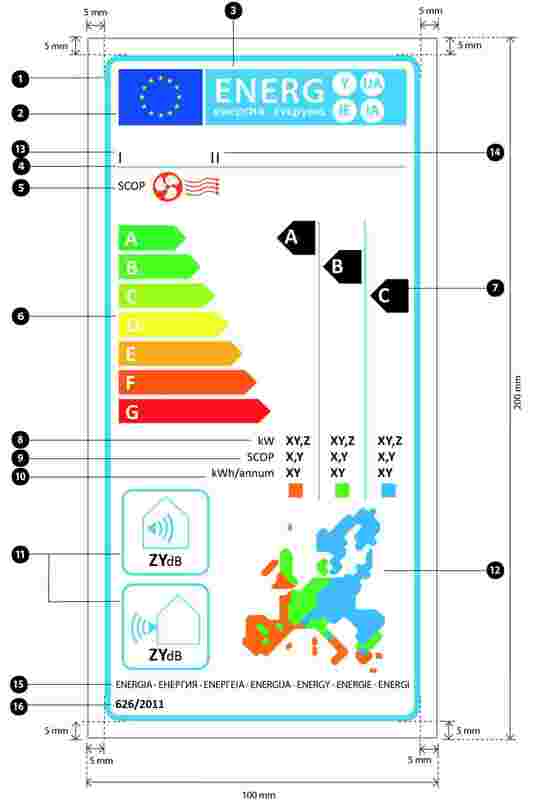 In order to facilitate the transition from Directive 2002/31/EC to this Regulation, air conditioners labelled in accordance with this Regulation should be considered compliant with Directive 2002/31/EC. 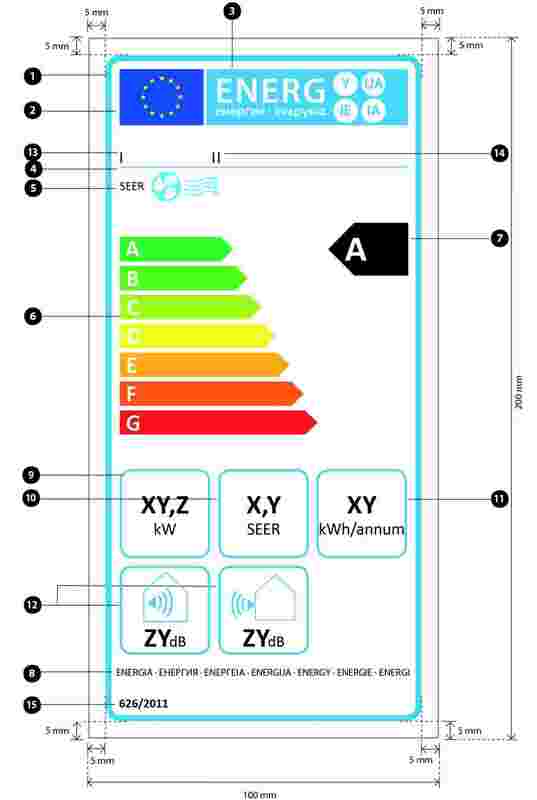 Suppliers wishing to place on the market air conditioners that can meet the requirements for higher energy efficiency classes should be allowed to provide labels showing those classes in advance of the date for mandatory display of such classes. 1. 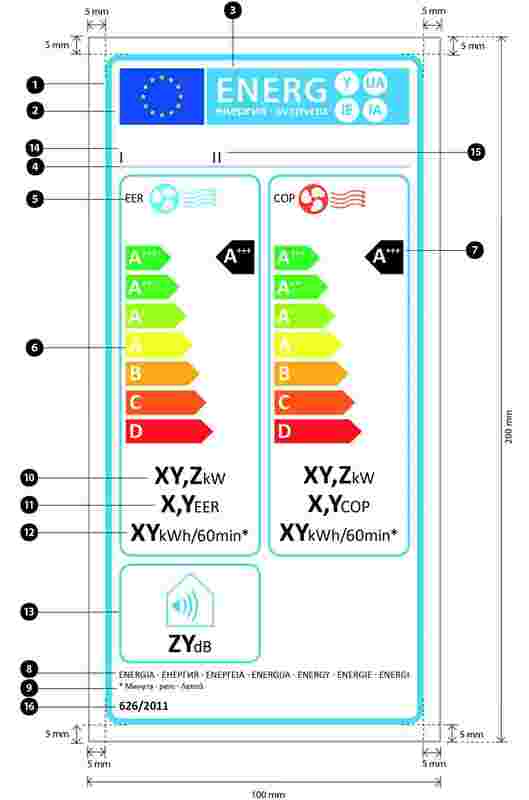 This Regulation establishes requirements for the labelling and the provision of supplementary product information for electric mains-operated air conditioners with a rated capacity of ≤ 12 kW for cooling, or heating, if the product has no cooling function. air conditioners of which the condensor- or evaporator-side, or both, do not use air for heat transfer medium. ‘point of sale’ means a location where air conditioners are displayed or offered for sale, hire or hire-purchase. Additional definitions for the purpose of Annexes II to VIII are set out in Annex I.
single ducts shall be named ‘local air conditioners’ in packaging, product documentation and in any advertisement material, whether electronic or in paper. 2. The energy efficiency class shall be determined as set out in Annex VII. 3. The format of the label for air conditioners except for single and double duct air conditioners shall be as set out in Annex III. 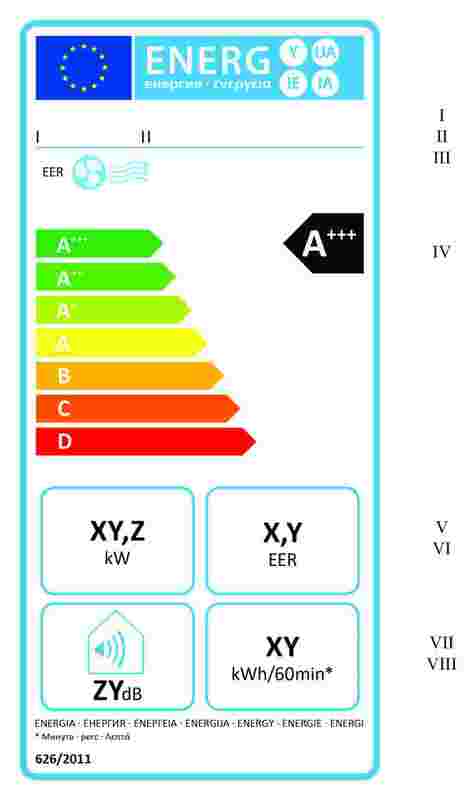 as regards air conditioners, except single duct and double duct air conditioners, placed on the market from 1 January 2019, labels with energy efficiency classes A+++, A++, A+, A, B, C, D shall be in accordance with point 1.4 of Annex III for reversible air conditioners, with point 2.4 of Annex III for cooling-only air conditioners and with point 3.4 of Annex III for heating-only air conditioners. 5. The format of the label for double duct air conditioners placed on the market from 1 January 2013 with energy efficiency classes A+++, A++, A+, A, B, C, D shall be in accordance with point 4.1 of Annex III for reversible double duct air conditioners, with point 4.3 of Annex III for cooling-only double duct air conditioners and with point 4.5 of Annex III for heating-only double duct air conditioners. 6. 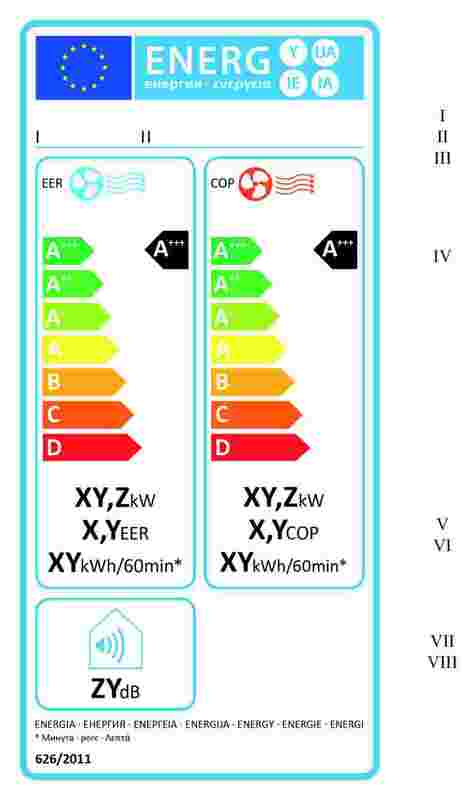 The format of the label for single duct air conditioners placed on the market from 1 January 2013 with energy efficiency classes A+++, A++, A+, A, B, C, D shall be in accordance with point 5.1 of Annex III for reversible single duct air conditioners, with point 5.3 of Annex III for cooling-only single ducts air conditioners and with point 5.5 of Annex III heating-only single duct air conditioners. single ducts shall be named ‘local air conditioners’ in packaging, product documentation and in any promotional or advertisement material, whether electronic or in paper. The information to be provided under Article 3 shall be obtained by reliable, accurate and reproducible measurement procedures, which take into account the recognised state of the art calculation and measurement methods, as set out in Annex VII. When Member States assess the conformity of the declared energy efficiency class, the annual or hourly energy consumption, as appropriate, and the noise emissions, they shall apply the procedure laid down in Annex VIII. The Commission shall review this Regulation in the light of technological progress no later than five years after its entry into force. In particular, attention will be paid to any significant changes in market shares of various types of appliances. Directive 2002/31/EC is repealed from 1 January 2013. 1. Air conditioners placed on the market before 1 January 2013 shall comply with the provisions set out in Directive 2002/31/EC. 2. It shall apply from 1 January 2013. Done at Brussels, 4 May 2011. (2) OJ L 86, 3.4.2002, p. 26. (5) OJ L 153, 18.06.2010, p. 1. ‘Capacity ratio’ means the ratio of the total declared cooling or heating capacity of all operating indoor units to the declared cooling or heating capacity of the outdoor unit at standard rating conditions. (1) OJ L 161, 14.6.2006, p. 1. (3) Climate Change, The IPCC Scientific Assessment, J.T Houghton, G.J.Jenkins, J.J. Ephraums (ed.) Cambridge University Press, Cambridge (UK) 1990. (4) OJ L 390, 31.12.2004, p. 24. The energy efficiency of air conditioners shall be determined on the basis of measurements and calculations set out Annex VII. Both the SEER and SCOP shall take into account the reference design conditions and the operational hours per relevant mode of operation, and the SCOP shall relate to the heating season ‘average’, as laid down in Annex VII. The rated energy efficiency ratio (EERrated) and the rated coefficient of performance (COPrated) shall relate to standard rating conditions, as laid down in Annex VII. European map with a display of three indicative heating seasons and corresponding colour squares. All the requested values shall be determined in accordance with Annex VII. The design of the label shall be in accordance with point 1.5. By way of derogation, where a model has been granted an ‘EU eco-label’ under Regulation (EC) No 66/2010 of the European Parliament and of the Council (1), a copy of the EU eco-label may be added. The information listed in point 1.1 shall be included in the label. The design aspects of the label shall be in accordance with point 1.5. The label shall be at least 120 mm wide and 210 mm high. Where the label is printed in a larger format, its content shall nevertheless remain proportionate to the specifications above. EU label border: stroke 5 pt – colour: cyan 100 % – round corners: 3,5 mm. width: 102 mm, height: 20 mm. Sub-logos border: 1 pt – colour: cyan 100 % – length: 103,6 mm. Text: Calibri regular 10 pt, capitals, 100 % black. Text: Calibri bold 16 pt, capitals, white. Text: Calibri bold 18 pt, capitals, white. Text: Calibri regular 9 pt, capitals, 100 % black. Value ‘XY,Z’: Calibri bold 11 pt, 100 % black. Text ‘SEER’/‘SCOP’: Calibri regular 10 pt, capitals, 100 % black. Value ‘X,Y’: Calibri bold 11 pt, 100 % black. Text ‘kWh/annum’: Calibri regular 10 pt, 100 % black. Value ‘XY’: Calibri bold 11 pt, 100 % black. Calibri regular 12 pt, 100 % black. The suppliers’ name or trade mark and model identifier should fit in a space of 102 × 13 mm. sound power levels for indoor and outdoor units expressed in dB(A) re1 pW, rounded to the nearest integer. The design of the label shall be in accordance with point 2.5. By way of derogation, where a model has been granted an ‘EU eco-label’ under Regulation (EC) No 66/2010, a copy of the EU eco-label may be added. The information listed in point 2.1 shall be included in the label. The design aspects of the label shall be in accordance with point 2.5. The label shall be at least 100 mm wide and 200 mm high. Where the label is printed in a larger format, its content shall nevertheless remain proportionate to the specifications above. EU label border: stroke: 5 pt – colour: cyan 100 % – round corners: 3,5 mm. Sub-logos border: 1 pt – colour: cyan 100 % – length: 93,7 mm. Text: Calibri bold 29 pt, capitals, white. Text: Calibri regular 8 pt, capitals, 100 % black. Text ‘kW’: Calibri regular 14 pt, 100 % black. Value ‘XY,Z’: Calibri bold 22 pt, 100 % black. Border: 3 pt – colour: cyan 100 % – round corners: 3,5 mm. Text ‘SEER’: Calibri regular 14 pt, capitals, 100 % black. Value ‘X,Y’: Calibri bold 22 pt, 100 % black. Text ‘kWh/annum’: Calibri regular 14 pt, 100 % black. Value ‘XY’: Calibri bold 22 pt, 100 % black. Value: Calibri bold 22 pt, 100 % black. Text: Calibri regular 14 pt, 100 % black. The suppliers’ name or trade mark and model identifier should fit in a space of 90 × 15 mm. The design of the label shall be in accordance with point 3.5. By way of derogation, where a model has been granted an ‘EU eco-label’ under Regulation (EC) No 66/2010, a copy of the EU eco-label may be added. The information listed in point 3.1 shall be included in the label. The design aspects of the label shall be in accordance with point 3.5. Pictogram as depicted: EU logo + energy label: width: 93 mm, height: 18 mm. Text ‘SCOP’: Calibri regular 10 pt, capitals, 100 % black. Value: Calibri bold 15 pt, 100 % black. Text: Calibri regular 12 pt, 100 % black. Text: Calibri bold 10, pt. sound power level for indoor unit expressed in dB(A) re1 pW, rounded to the nearest integer. The design of the label shall be in accordance with point 4.2. By way of derogation, where a model has been granted an ‘EU eco-label’ under Regulation (EC) No 66/2010, a copy of the EU eco-label may be added. 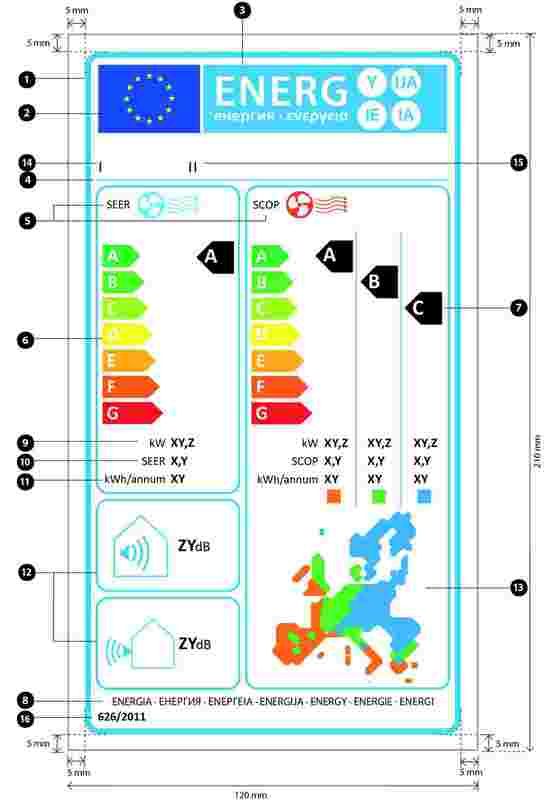 Pictogram as depicted: EU logo + energy label: width: 82 mm, height: 16 mm. Sub-logos border: 1 pt – colour: cyan 100 % – length: 92,5 mm. Calibri bold 7 pt, white. Calibri bold 18 pt, capitals, white. Text: Calibri regular 7 pt, 100 % black. Text ‘EER’/‘COP’: Calibri regular 14 pt, capitals, 100 % black. Text ‘kWh/60min*’: Calibri regular 14 pt, 100 % black. The suppliers’ name or trade mark and model identifier should fit in a space of 82 × 10,5 mm. The design of the label shall be in accordance with point 4.4. By way of derogation, where a model has been granted an ‘EU eco-label’ under Regulation (EC) No 66/2010, a copy of the EU eco-label may be added. Calibri bold 14 pt, white. Text ‘EER’: Calibri regular 14 pt, capitals, 100 % black. Border: 2 pt – colour: 100 % cyan – round corners: 3,5 mm. The design of the label shall be in accordance with point 4.6. By way of derogation, where a model has been granted an ‘EU eco-label’ under Regulation (EC) No 66/2010, a copy of the EU eco-label may be added. Sub-logos border: 1 pt – colour: 100 % cyan – length: 92,5 mm. Text ‘COP’: Calibri regular 14 pt, capitals, 100 % black. The design of the label shall be in accordance with point 5.2. By way of derogation, where a model has been granted an ‘EU eco-label’ under Regulation (EC) No 66/2010, a copy of the EU eco-label may be added. Text: Calibri regular 14 pt, capitals, 100 % black. The design of the label shall be in accordance with point 5.4. By way of derogation, where a model has been granted an ‘EU eco-label’ under Regulation (EC) No 66/2010, a copy of the EU eco-label may be added. Calibri bold 14 pt, capitals, white. The design of the label shall be in accordance with point 5.6. By way of derogation, where a model has been granted an ‘EU eco-label’ under Regulation (EC) No 66/2010, a copy of the EU eco-label may be added. the declared capacity and an indication of the back up heating capacity assumed for the calculation of SCOP at reference design conditions. 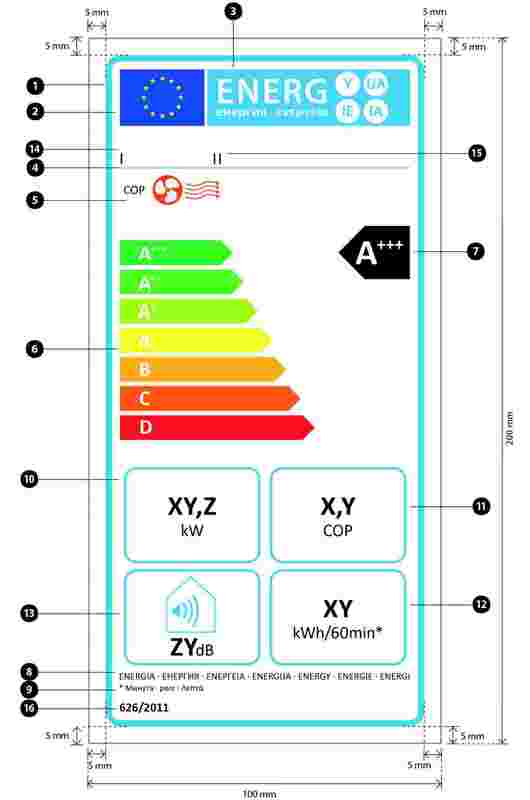 the heating capacity Prated in kW of the appliance determined in accordance with definitions and test procedures in Annex I and VII. One fiche may cover a number of appliance models supplied by the same supplier. The information contained in the fiche may be given in the form of a copy of the label, either in colour or in black and white. Where this is the case, the information listed in points 1-4 not already displayed on the label shall also be provided. the name and GWP of refrigerant used. Suppliers may include additional information at the end of the above list. Where the information included in the technical documentation file for a particular air conditioner model has been obtained by calculation on the basis of design, or extrapolation from other equivalent appliances, or both, the documentation shall include details of such calculations or extrapolations, or both, and of tests undertaken by suppliers to verify the accuracy of the calculations undertaken. The information shall also include a list of all other equivalent appliance models where the information was obtained on the same basis. Name and GWP of refrigerant used. Where other information contained in the product information fiche is also provided, it shall be in the form and order specified in Annex IV. For the purposes of compliance and verification of compliance with the requirements of this Regulation, measurements and calculations shall be made using harmonised standards the reference numbers of which have been published in the Official Journal of European Union, or other reliable, accurate and reproducible method, which takes into account the generally recognised state of the art methods, and whose results are deemed to be of low uncertainty. The contribution of a back-up heater (if applicable) in the calculation of the seasonal efficiency of a unit in heating mode. Where the information relating to a specific model, being a combination of indoor and outdoor unit(s), has been obtained by calculation on the basis of design, and/or extrapolation from other combinations, the documentation should include details of such calculations and/or extrapolations, and of tests undertaken to verify the accuracy of the calculations undertaken (including details of the mathematical model for calculating performance of such combinations, and of measurements taken to verify this model). The energy efficiency ratio (EERrated) and, when applicable, coefficient of performance (COPrated) for double ducts and single ducts shall be established at the standard rating conditions as defined in Table 2 of this Annex. The calculation of electricity consumption for cooling and/or heating shall take into account electric energy consumption of all relevant modes of operation, when appropriate, using time periods as defined in Table 4 of this Annex. (1) In case of single ducts, the condensor (evaporator) when cooling (heating), is not supplied with outdoor air, but indoor air. When performing the market surveillance checks referred to in Article 3 (2) of Directive 2009/125/EC, the authorities of the Member States shall apply the following verification procedure for the requirements set out in Annex II. The authorities of the Member State shall test one single unit. The model of the air conditioner, except single and double ducts, shall be considered to comply with the provisions set out in Annex I, as applicable, to this Regulation, if its seasonal energy efficiency ratio (SEER), or seasonal coefficient of performance (SCOP), if applicable, is not less than the declared value minus 8 %. The SEER and SCOP values shall be established in accordance with Annex II. The model of a single and double duct air conditioner shall be considered to comply with the provisions set out in Annex I, as applicable, to this Regulation, if the results for off-mode and standby-mode conditions do not exceed the limit values by more than 10 %, and if the energy efficiency ratio (EERrated), or coefficient for performance (COPrated), if applicable, is not less than the declared value minus 10 %. The EER and COP values shall be established in accordance with Annex II. 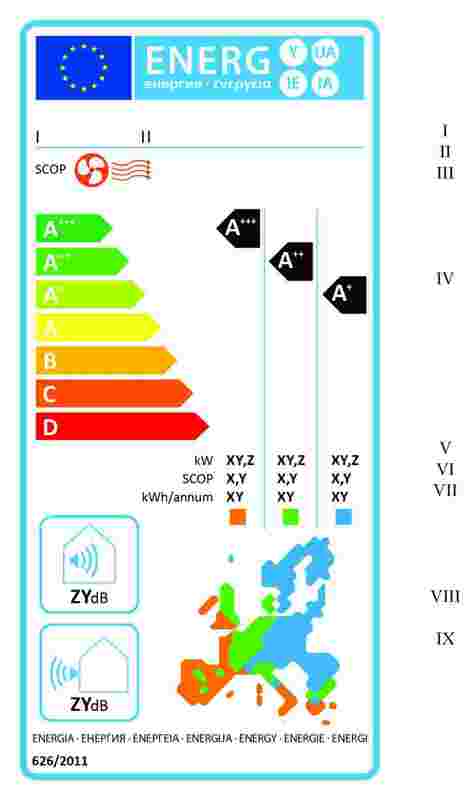 The model of the air conditioner shall be considered to comply with the provisions set out in this Regulation, as applicable, if the maximum sound power level does not exceed more than 2 dB(A) of the declared value. If the result referred to in point 2 is not achieved, the market surveillance authority shall randomly select three additional units of the same model for testing. The model of the air conditioner, except single and double ducts, shall be considered to comply with the provisions set out in Annex I, as applicable, to this Regulation, if the average of the three units for the seasonal energy efficiency ratio (SEER), or seasonal coefficient of performance (SCOP), if applicable, is not less than the declared value minus 8 %. The SEER and SCOP values shall be established in accordance with Annex II. The model of a single and double duct air conditioner shall be considered to comply with the provisions set out in Annex I, as applicable, to this Regulation, if the average of the results of the three units for off-mode and standby-mode conditions do not exceed the limit values by more than 10 %, and if the average of the energy efficiency ratio (EERrated), or coefficient of performance (COPrated), is not less than the declared value minus 10 %. The EER and COP values shall be established in accordance with Annex II. The model of the air conditioner shall be considered to comply with the provisions set out in this Regulation, as applicable, if the average of the results of the three units for sound power level does not exceed more than 2 dB(A) of the declared value. For the purposes of compliance and verification of compliance with the requirements of this Regulation, Member States shall apply the procedures referred to in Annex II and harmonised standards the reference numbers of which have been published in the Official Journal of European Union, or other reliable, accurate and reproducible calculation and measurement methods, which take into account the generally recognised state of the art.